This statistic displays the enjoyment of reading books in the United Kingdom in 2013, broken down by segment. 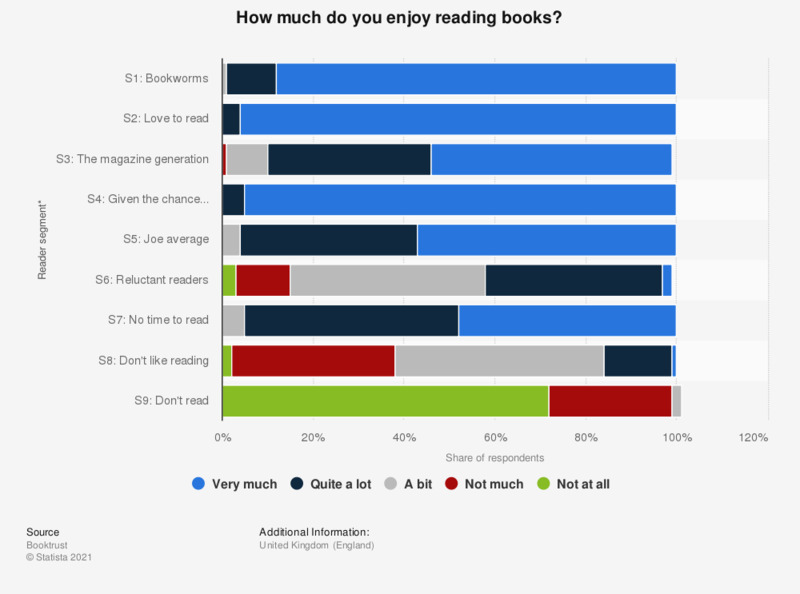 96 percent of respondents who 'love to read' reported enjoying reading books very much, while 43 percent of 'reluctant readers' enjoyed reading books a bit. * S1: 'Bookworms' = 6 percent; S2: 'Love to read' = 15 percent; S3: 'The magazine generation' = 14 percent; S4: 'Given the chance...' = 8 percent; S5: 'Joe average' = 17 percent; S6: 'Reluctant readers' = 10 percent; S7: 'No time to read' = 10 percent; S8: 'Don't like reading' = 11 percent; S9: 'Don't read' = 10 percent. The source provides definitions of the reader segmentation model used on page seven of the Booktrust Reading Habits Survey report.